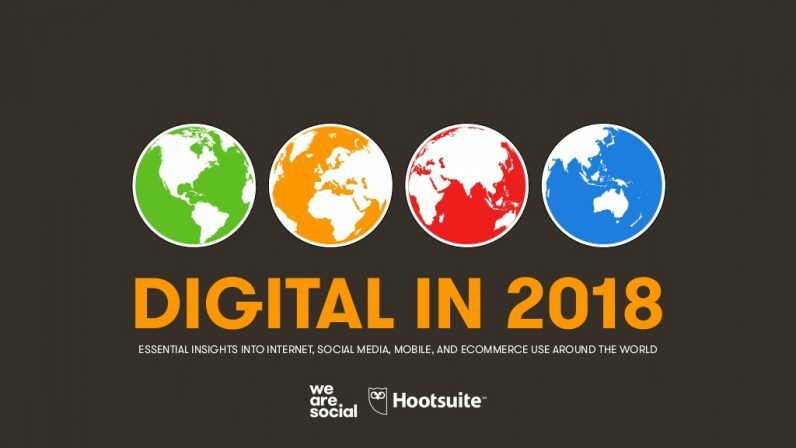 The new 2018 Global Digital suite of reports from We Are Social and Hootsuite reveals that there are now more than four billion people around the world using the internet. Social media use continues to grow rapidly too, and the number of people using the top platform in each country has increased by almost one million new users every day during the past 12 months. More than three billion people around the world now use social media each month, with nine in 10 of those users accessing their chosen platforms via mobile devices. The latest data from GlobalWebIndex shows that the average internet user now spends around six hours each day using internet-powered devices and services — that’s roughly one-third of their waking lives. If we add this together for all four billion of the world’s internet users, we’ll spend a staggering one billion years online in 2018. Users in Africa are up by more than 20 percent year-on-year, with the reported number of internet users in Mali increasing by almost six times since January 2017. The number of internet users in Benin, Sierra Leone, Niger, and Mozambique has more than doubled over the past year too. This isn’t just a story about ‘the next billion,’ though. More than two-thirds of the world’s population now has a mobile device, with most people now using a smartphone. The number of unique mobile users around the world is up by more than four percent year-on-year, although penetration rates remain below 50 percent across much of Central Africa. What’s more, this data is just for web use. The latest data from App Annie shows that people now spend seven times longer using mobile apps compared to mobile web browsers, so mobile’s ‘share of internet’ is likely even higher than the figures above suggest. The latest data from Facebook reinforces this finding, with just five percent of the platform’s global user base not accessing the platform via a mobile device. Almost one million people started using social media for the first time every day over the past year — that’s equivalent to more than 11 new users every second. The global number of people using social media has grown by 13 percent in the past 12 months, with Central and Southern Asia recording the fastest gains — up 90 percent and 33 percent respectively. The number of teenagers using Facebook has also increased, but the number of users aged 13 to 17 has only grown by five percent since January 2017. For the third year in a row, Filipinos spend the greatest amount of time on social media, with the average user in the country spending almost four hours on social every day. To help businesses everywhere quantify the Instagram opportunity in their respective countries, I’ve included local numbers for Instagram use across more than 230 countries in this year’s regional reports. You’ll find links to those at the end of this post. Despite the depressing trends, these numbers will be valuable benchmarks for marketers everywhere — especially because they offer insights into the number of brands using paid media (the chart below is a summary of slides 69 and 72 in the Digital in 2018 report). Mobile users in six countries — including the Netherlands, Singapore, and the UAE — now enjoy average connection speeds of more than 50 Mbps. At the other end of the spectrum, mobile users in 18 countries — including India and Indonesia — still suffer from average connection speeds of less than 10 Mbps. Partly thanks to these faster download speeds, the average smartphone user around the world now consumes almost 3GB of data every month — an increase more than 50 percent since this time last year. The latest data from Statista’s Digital Market Outlook shows that the total value of the ecommerce market for consumer goods grew by 16 percent over the past year. Total annual spend in 2017 reached almost US$1.5 trillion, with fashion products representing the largest single category. Worldwide, the number of people using ecommerce platforms to buy consumer goods — e.g. fashion, food, electronics, and toys — grew by eight percent, with almost 1.8 billion people around the world now buying online. Roughly 45 percent of all internet users now use ecommerce sites, but penetration varies considerably between countries. The amount that each person spends on ecommerce is also growing, with average revenues per user (ARPU) up by seven percent year-on-year to reach US$833. The British are the biggest ecommerce spenders, with annual spend in the UK now greater than $2,000 USD per user. It’s worth highlighting that these are just the figures for consumer goods too; if we add spend on other categories such as travel, digital content, and mobile apps, total global ecommerce value is likely to be closer to $2 trillion USD.